I’m happy to have 2 paintings on display at the Attleboro Arts Museum for their annual members show through February 1st, 2018. 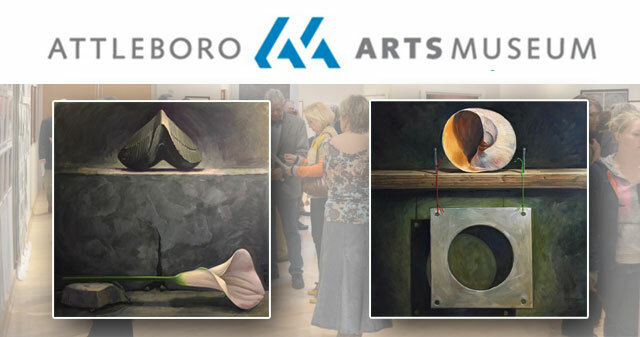 The Attleboro Arts Museum typically hosts 8 exhibitions and over 40 events per year and is located at 86 Park Street, Attleboro, Massachusetts, 02703 | 508.222.2644. ATTLEBORO — The Attleboro Arts Museum, 86 Park St., will hold its annual Members’ Exhibition and Museum Gift Shop Holiday Extravaganza next month. The exhibition dates are Dec. 9 to Feb. 1, with an opening awards reception from 2 to 4 p.m. Saturday, Dec. 9. It’s free and open to all. The members’ show encompasses over 400 works of art and will be held in the museum’s Ottmar Gallery. All works are accepted into the show, and once they are on display, guest juror Sarah Swift, visual artist and director of the Hera Gallery, will award cash prizes, art materials and certificates of merit. “This exhibition is emblematic of our artists’ versatility, courage, and high level of talent,” said Mim Brooks Fawcett, the museum’s director and chief curator.